We have been every year since the barns opened. That says it all. So well positioned for all of Cornwall. We used to live in Cornwall, now farm in the New Forest but the farm barns are like a second home. The owners are so accommodating. Especially this year when my daughter got married in Truro. Thank you all. Thank you for your lovely welcome, we have had a very relaxing time just chilling out away from everyday stress. Dogs have had a wonderful time with lots of exercise on the lovely beaches. Thanks again. Lovely property with all that we required. Lovely well equipped venue. Most comfortable holiday bed I have ever slept in! Had a lovely meal in the snug at the Malsters Arms, Chapel Amble, very child friendly place. Delightful place, great cycling and walking. Would def. recommend. Lovely comfortable accommodation and delicious cream tea on arrival. Thank you. A very well equipped cottage and great location. 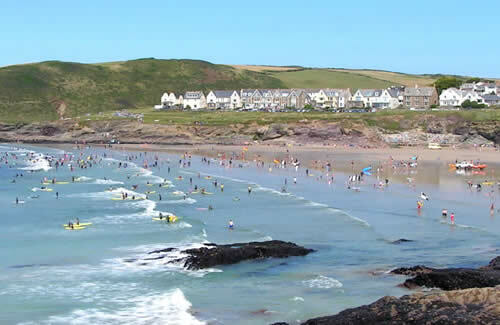 Favourite beach - Daymer Bay, Rock and walking around the coast. Excellent meal at Malsters, Chapel Amble. Thank you for the cream tea. Will recommend. Fantastic stay. Thank you! So much to see and do. Highlights - Minack Theatre, Cornish Coasteering, Camel Trail and Vineyard. Our 9th year - enough said. Lovely.